(July 8, 2014) — A book by two University of Kentucky professors was highlighted recently in a Huffington Post blog by author Janet Mason. 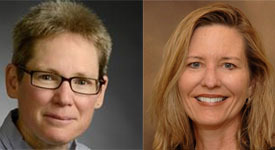 "A Positive View of LGBTQ: Embracing Identity and Cultivating Well-Being" by Sharon Rostosky, professor of counseling psychology in the UK College of Education and Ellen Riggle, professor of political science in the UK College of Arts and Sciences, is one of two books Mason focused on as exhibiting the importance of identity in the LGBTQ community. Mason said the book "talks about the unique strengths that being LGBTQ can engender, including looking at relationships differently, having compassion for other oppressed groups based on our own 'outsider' status, and using the introspection that comes from the necessary self-understanding about your sexual orientation or gender identification to be true to yourself in all ways." The book gives individuals' firsthand accounts of positive LGBTQ identities and Mason included two of those excerpts from the book in her blog. She also talks about another book focusing on LGBTQ and identity, "Living Out Islam: Voices of Gay, Lesbian and Transgender Muslims" by Scott Siraj al-Haqq Kugle. The blog, titled "A Positive View of LGBTQ and Living Out Islam: There Is Magic All Around" can be found on the Huffington Post website. The blog has been reprinted on a variety of websites around the world. Mason's latest book, "Tea Leaves" is a personal memoir.